A blood clot in your calf can lead to some serious consequences. Being able to identify the symptoms of a blood clot can help you catch the condition early and greatly improve your chances of making a full and speedy recovery. A blood clot will cause your calf to noticeably swell up. There is often some pain associated with a blood clot that feels like a cramp, pulled muscle or Charley horse. A blood clot can cause the skin on the calf to become a reddish or bluish color. The surface of the calf can feel warm to the touch if a blood clot lies underneath. A blood clot is known as deep vein thrombosis (DVT) and can be the result of surgery, an injury, certain genetic disorders, cancer, smoking, and obesity. Even sitting for a prolonged length of time can cause a clot to form because blood flow may be restricted during this time. Pregnant women are also susceptible to blood clots due to an increased level of estrogen and an expanding uterus. A blood clot that starts in your calf can break off and travel through the bloodstream to the lung. Once there, the clot can become stuck and and block the flow of blood, causing organ damage and even death. This is called a pulmonary embolism (PE). If you experience any of the symptoms below, call 911 or go the the emergency room immediately. Blood clots that are left untreated can spread to other parts of the body and lead to more serious problems. In fact, up to 100,000 people die each year from blood clots. Fortunately, most blood clots are easily treated when found early. If you experience swelling, pain, discoloration, or unusual warmth in your calf, see a medical professional immediately. 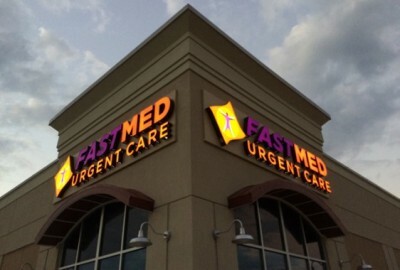 FastMed Urgent Care is open seven days a week with extended hours Monday through Friday. Find a FastMed near you today!